If you have a dietary restriction, medical concern or are a vegetarian and need to find an alternative to cow’s milk, consider a plant-based substitute such as rice milk, soy milk or almond milk. Each type of milk has health benefits and advantages that may suit your needs and taste preference. In addition to nutritional differences, it may be helpful to know which types of milk may have adverse effects. Rice milk is made by pressing boiled brown and white rice through a mill using diffusion, then straining it. Rice milk is the least likely to trigger allergies, and it's a good alternative to dairy if you're lactose intolerant or can't digest soybeans. It's commonly available in shelf-stable, flavored, unsweetened and organic varieties. When compared to soy and almond milk, rice milk is the least allergenic. So if you have issues with food allergies, rice milk may be your best bet. The downside to rice milk is that it's often high in added sugar, and low in protein. Although the high carbohydrate content gives it a naturally sweet taste, flavors and sweeteners are usually added. Most brands fortify rice milk with calcium, in the form of tricalcium phosphate; vitamins A, D and often niacin and B12; and folic acid. Some brands of rice milk may contain carrageenan, an additive derived from seaweed used to thicken the milk. Although approved by the FDA, carrageenan may trigger inflammation, contribute to stomach ulcers or damage your digestive system. In addition, drinking too much rice milk may put you at risk for health issues due to high inorganic arsenic levels found in rice, according to the FDA. Soy milk is made by soaking and grinding soybeans, cooking the mixture and then straining the contents. It has a "beany" flavor, so it often has sugar and flavoring added to improve the taste. If you have an allergy to soybeans, soy milk would not be a suitable choice. As with most plant-based dairy alternatives, soy milk is often fortified with calcium, vitamin D and other minerals. Unfortified soy milk has more protein than its unfortified counterparts. Soy milk also has more fiber content than rice or almond milk. A study, published in the Journal of Food Science and Technology in 2017, found that soy milk was the best replacement for cow's milk in terms of its balanced nutritional profile and high protein content compared to rice and almond milk. According to McGill University, soy milk may have anti-carcinogenic properties from its phytonutrients known as isoflavones. Almond milk is made by grinding blanched almonds with water and then filtering out the pulp. Some almond milk nutrition labels list almonds as raw. However, in the U.S., all almonds must be pasteurized by steam treating or by using a fumigant that the USDA and EPA consider safe. Organic almond milk is treated with steam. Unfortunately, removing the skin and fiber also removes a large portion of the antioxidant properties of whole almonds. Almond milk may not be suitable if you have a nut allergy. It's available fresh, flavored, unsweetened and in shelf-stable varieties. One brand of almond milk, Berber, contains only 2 ingredients — almonds and water. According to the nutrition facts label, it has 4 percent daily value (DV) for calcium, 10 percent DV for protein, 5 percent DV for saturated fat and 5 percent DV for potassium. Therefore, as an unfortified product, almond milk doesn't naturally contain vitamin E, A, D or B12. Vitamins, minerals and calcium are typically added to almost all brands of almond milk. Salt is often added too. Although unsweetened varieties are available, check the label as cane sugar is often in the list of ingredients. Beware that many brands of almond milk are actually very low in almonds — some containing only 2 percent. Also, some brands of almond milk contain carrageenan. The recommended intake for vitamin D is 600 international units per day. Vitamin D helps your body absorb calcium, so it’s essential for the development of bones and teeth, especially important to children. To help with vitamin D deficiency, dairy milk must be fortified by law in Canada and the U.S. However, there's no such requirement for nondairy milks. Because plant-based milks, including soy, rice and almond milk, don't naturally contain vitamin D and aren't nutritionally equivalent to cow’s milk, most manufacturers enrich their products with various amounts of vitamins, such as vitamin D; minerals, such as calcium; and protein. Fortification also restores vitamin and mineral content lost during processing, according to the Journal of Food Science and Technology. A 2014 study found that young children who drank dairy substitutes were about half as likely to have adequate vitamin D levels as children who drank cow’s milk. These findings, published in the Canadian Medical Association Journal, emphasized the health danger of giving young children milk substitutes that aren't fortified. Dietary Guidelines for Americans, 2015-2020, recommends a daily caloric intake ranging from 1,600 to 2,400 calories for adult women and 2,000 to 3,000 calories for adult men, depending on age and level of activity. If you're on a calorie-restricted diet, unsweetened shelf-stable almond milk is your best choice, with 39 calories per cup, according to the USDA. Unsweetened rice milk provides 113 calories, while unfortified soy milk has the highest content with 131 calories in 1 cup, according to the USDA National Nutrient Database. The caloric content of all of these milks can increase dramatically with the flavored and sweetened varieties. Carbohydrates in your diet provide energy. If you're counting carbs for weight loss or diabetes, unsweetened almond milk only contains 1.5 grams per cup, but it contains no fiber. One cup of unfortified soy milk provides 15 grams of carbohydrates, of which 1.5 grams are dietary fiber. Unsweetened rice milk has the most carbs, with 22 grams — which adds 7 percent to your recommended daily allowance — and 0.7 gram of fiber. According to Dietary Guidelines, 10 to 35 percent of your daily caloric intake should consist of protein. On a 2,000-calorie diet, your protein needs would range from 50 to 175 grams a day. Protein plays an essential role in every cell, tissue and organ in your body. Unfortified soy milk contains the most protein at 8 grams per cup. 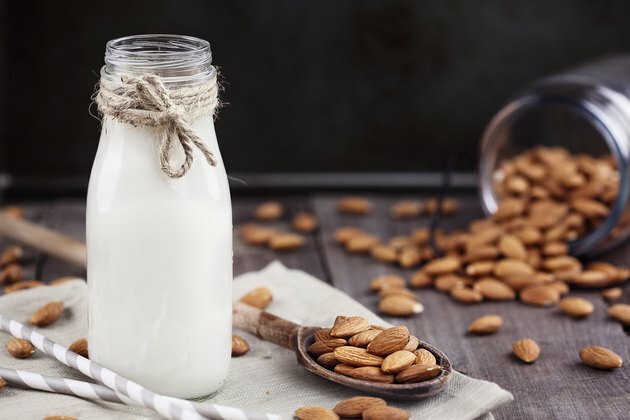 Although almonds are a good source of protein, almond milk is not especially rich in this nutrient — the USDA lists protein in unsweetened almond milk at 1 gram per cup but this amount varies depending on the amount of almonds in the milk. Unfortified rice milk has almost no protein, with 0.7 gram. Your body needs fats to support cell growth and as a long-term source of energy. Fats also help with the absorption of certain vitamins and minerals in your body. For the average healthy adult, you should get 20 to 35 percent of your calories from fat. On a 2,000-calorie diet, your needs would range from 44 to 78 grams of fat a day. Unfortified soy milk has the highest fat content, with 4.3 grams per cup, or 3 percent DV. Unsweetened rice and almond milk each contain about 3 grams of fat. Rice, soy and almond milks are plant based, so they don't contain cholesterol — but soy milk and almond milk have a trace amount of saturated fat. All three milks contain the beneficial polyunsaturated fatty acids that help to lower blood cholesterol and triglyceride levels. Soy milk has the most polyunsaturates, with 2.3 gram per cup. Rice milk has .75 grams per cup, followed by almond milk, with 0.63 gram. Almond and rice milk have 1.9 and 1.5 grams, respectively, of heart-healthy monounsaturated fats in each cup. Soy milk contains 1 gram per cup of monounsaturates. Commercially prepared plant-based milks often have sugar added. Drinking sweetened beverages increases calorie content and your overall added sugar intake and may put you at risk of weight gain and health issues that come with carrying extra weight, such as blood sugar problems and heart disease. The good news is that unsweetened soy, rice and almond milks have little or no sugar. However, with the flavor-added milks, the sugar content can skyrocket. For example, a cup of Almond Breeze Chocolate Almond Milk has 18 grams of sugar, and Rice Dream Chocolate Flavored Rice Milk contains a whopping 28 grams of sugar per cup. Because of the vast differences in added sugar content, be a label reader when it comes to choosing dairy alternatives and stick with the unsweetened varieties. You should strive to include 1,000 milligrams of calcium in your diet each day, more if you're over 50 years of age. You need calcium for maintenance of strong bones. Calcium also helps your heart, nerves and muscles function properly. Children who don't get enough calcium may not grow to their full adult height, and adults may develop low bone mass and be at risk for osteoporosis, according to the Mayo Clinic. Rice, soy and almond milks are often fortified with calcium to help children reach the recommended daily intake for calcium. Since no standard fortification level is required, the calcium content in rice, soy and almond milks varies considerably. Some plant-based milks aren't fortified at all, another reason it's important to read labels. Most brands of fortified rice milk contain 25 to 30 percent DV for calcium due to the addition of tricalcium phosphate. This is similar in calcium content to a glass of dairy milk. However, without enrichment, rice and soy milk only contain about 6 percent DV for calcium; unfortified almond milk contains 4 percent. Because of the overall low protein content of plant-based milks, they're not good alternatives to breast milk or dairy-based infant formula for the first 2 years of life. For children older than 2 years of age, who can't drink cow’s milk due to medical reasons, plant-based milk should be fortified to contain at least 6 grams of protein per cup, according to a trial published in the Journal of Food Science and Technology in 2016. Some concern has been raised regarding the phytoestrogen content of soy milk in infant formulas. A study found infants fed soy-based milk had a much higher content of estrogen compared to human breast milk. The Nutrition Digest suggests that the excessive estrogen might have negative effects on normal sexual development in very young children. However, the American Academy of Pediatrics has found no conclusive evidence that soy in infant formula is not a safe alternative to cow's milk in typical dietary quantities. But they do recommend not feeding soy products to preterm babies with birth weights less than 1,800 grams or to prevent colic, allergy or celiac disease. Journal of Food Science and Technology: How Well Do Plant Based Alternatives Fare Nutritionally Compared to Cow’s Milk? FCRN: How Well Do Plant Based Alternatives Fare Nutritionally Compared to Cow’s Milk? Mayo Clinic: Are You Getting Too Much Protein?